Over the course of the last decade, swimming with the dolphins has become a popular, exciting and somewhat expensive pasttime. As just about anything having to do with dolphins these days, swimming with dolphins have come under fire of animal activist groups and dolphin lovers alike. Most of the critics of this pasttime believe that swimming with dolphins are simply exploiting these beautiful creatures for profit while others believe that the dolphins are enjoying the visits as much as their human counterparts. Lately, swimming with dolphins are being conducted in almost every corner of the world. In some cases, swimming with dolphins are actually performed in the ocean with wild dolphins while others are being conducted in more controlled aquarium environments. The strongest criticism is directed at the aquariums that are holding dolphins in captivity. More often than not, it’s the captive concept that angers animal rights activists rather than swimming with dolphins itself. Since science seems to have proven that dolphins are not happy or well adjusted when living in captivity, we’d like to suggest that if at all possible, dolphin enthusiasts avoid contributing to this type of entertainment. If you’re considering swimming with dolphins, visiting them in their own environment as they guest seems much more humane. In the ocean, dolphins have the choice of interacting or not, consequently if they’re sticking around and seem to be satisfying their own curiosity, dolphin swims seem harmless. It is important, however, to make sure that the company you decide to use as a tour guide is reputable in any sense and respectful of the environment. The reputable companies to hire for swimming with dolphins will have rules that are made to protect the dolphins and their habitat. For example, most wild swim tours forbid touching or feeding the dolphins. This is their way of making sure that the dolphins stay wild and do not become dependent upon their human visitors. While some operators will use different tactics to lure the dolphins, avoid those who circle or chase them when they’ve left the swimmers behind. Try and find a tour operator that limits his groups to 6-10 people. Large groups of 20 or more are an invasion rather than a visit. Keep in mind that reputable tour operators will leave the interaction decisions up to the dolphins themselves. Dolphins notoriously have short attention spans and interactions will normally last less than an hour and a half. Good programs will also own their own boats and will offer tours that are long enough to allow the opportunity to interact with the dolphins on their time frame rather than ours. There are even some programs that will actually allow you to live on board, basically meaning that you stay on the boat for your entire stay, a few days or even a week, but that will depend on your interests and the kind of vacation you would like to have. 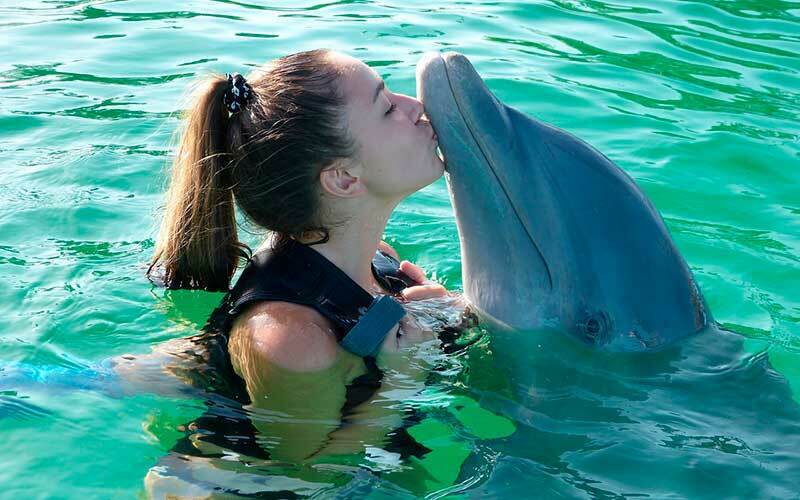 If you are planning your travel adventure to watch or swim with dolphins, don´t forget to print your destination miniguide from travelocity to have the greatest fun.